Yesterday we wrote about Yves’ creative relationship with Morocco which influenced his color choices as well as his styling. Today we bring you options for creating looks inspired by YSL, the colors of Morocco, and Spring’s hottest trend The 1970′s. Printed pants are a key trend for Spring and these psychedelic silk versions by SANDRO have all the right colors to impact your spring wardrobe. Buy here. LOVER’S pink silk peasant blouse is a must have for the season and the color is versatile enough to wear with every color in the rainbow. Buy here. Jacquard is a fabric we saw a lot of on the Fall runways, get a jump on the trend with these bow-belted shorts by THREAD SOCIAL. Buy here. A maxi dress is a must have for Spring, and this halter style by MILLY uses the freshest colors to make an impact. Buy here. It’s all about the platform wedge for Spring and this neutral colored pair by MODERN VINTAGE are a great option. Buy here. 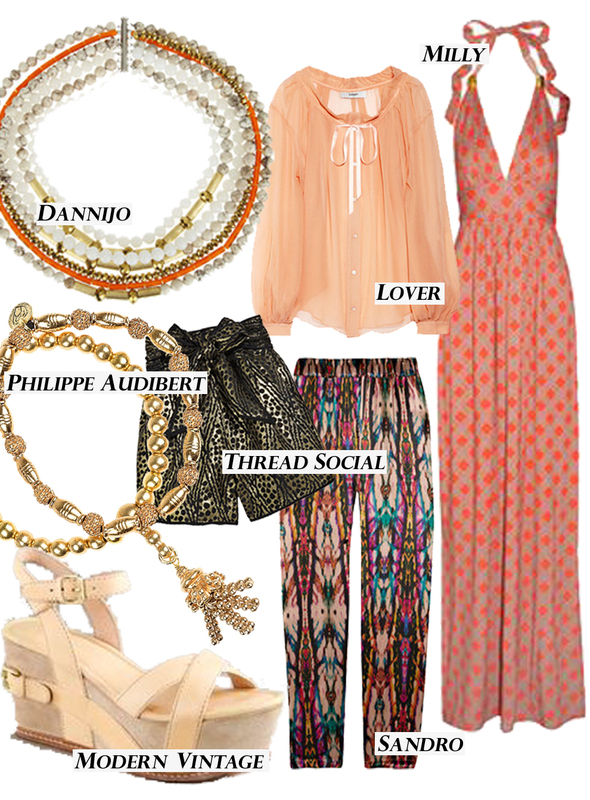 Top the looks off with a multi-strand choker by DANNIJO and make a statement with PHILIPPE AUDIBERT’S gold anklets. Pump it up this season with a bold mixture of colors and luxe elements. This bright orange double-breasted blazer by STEVEN ALAN hits two major trends in one and also prepares you for the Fall Season. Buy here. 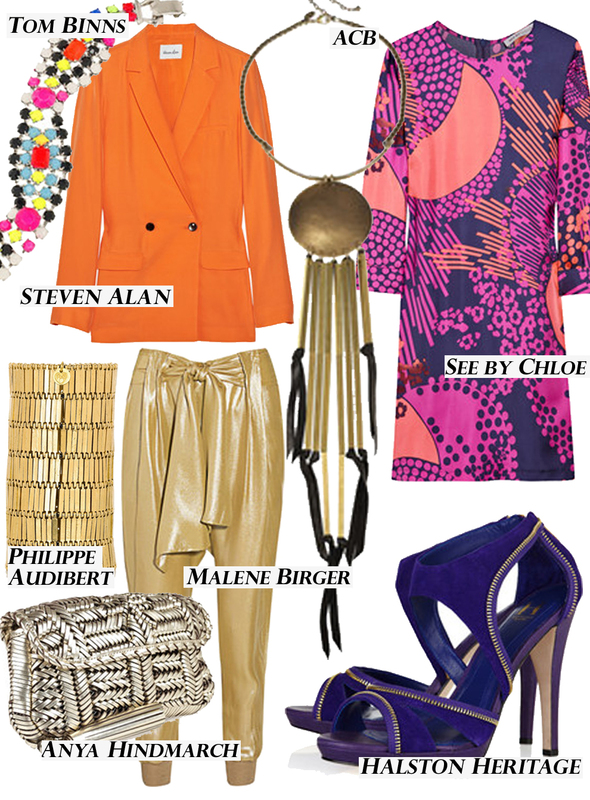 Paired with gold silk harem pants BY MALENE BIRGER, and the look of Marrakech takes a modern spin. Buy here. PHILIPPE AUDIBERT’S gold plated wide cuff adds the perfect amount of drama to make a 70′s statement. Buy here. Top the look off with a pair of purple zip detailed heels by HALSTON HERITAGE. Buy here. SEE BY CHLOE’S celestial printed silk dress tunic dress is bold and mixes all top colors for Spring. Buy here. The 1970′s styling wouldn’t be complete without this tasseled leather and brass statement necklace by ABC. Buy here. TOM BINN’S is always right with whatever you wear and this hand painted Swarovski Crystal bracelet is a classic. Buy here. This metallic woven clutch by ANYA HINDMARCH is perfect for the Spring season and will be great in your handbag collection forever. Buy here. Purchasing any of these items will get you ready for Spring and will carry your wardrobe into the Fall season. Happy shopping! !